Today’s snake in the spotlight is the Texas Garter Snake – a subspecies of the well known and approachable Garter Snake. Texas Garter Snakes eat amphibians, earthworms, and small fish such as minnows. Their primary habitat is Texas’ tall-grass prairies; less than 1% of these prairies remain in Texas. Originally, Texas Garter Snakes found their prey in the small ponds that were found throughout these tall-grass prairies. Texas Garter Snakes have unique features, but they can be easily confused with other garter snakes and ribbon snakes. Notice the bright, red-orange stripe running down the pictured snake’s back, and its low, yellowish side-stripes. In between the back and side stripes are a series of yellowish checkerboard markings. 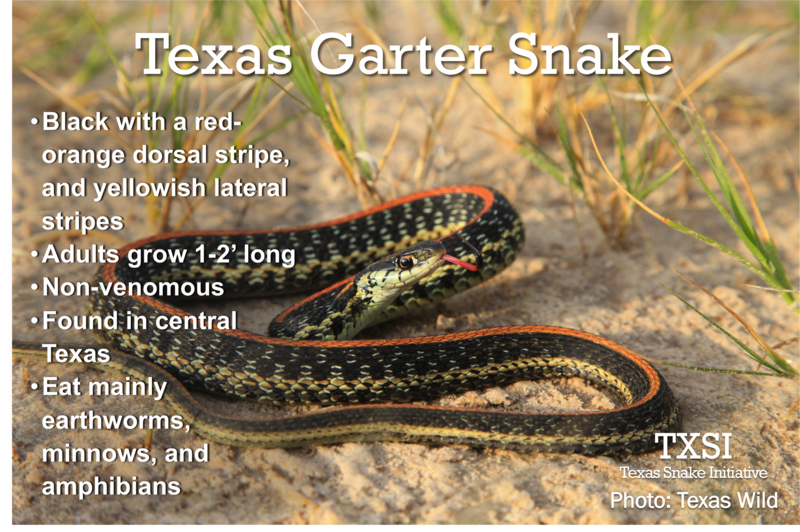 The combination of all of these features can be used to distinguish Texas Garter Snakes from their similarly marked friends.